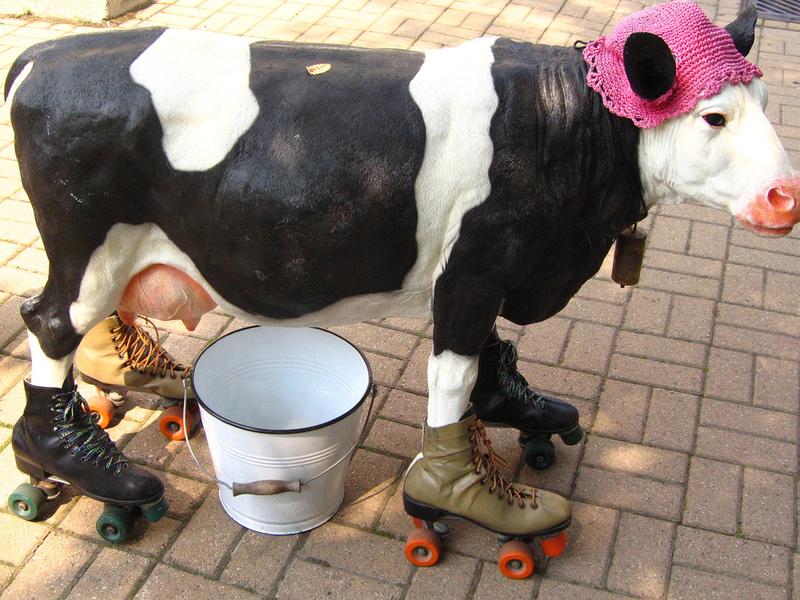 Bovine roller-skating accidents? More common than you’d think. Has your doctor has ever diagnosed you with Hair in the Urine or Donald Duck Speech? I’m a doctor and have no idea how to treat either condition. My wild guess might be a sieve and a good gargle—in that order, reserving the gargling for the latter, obviously. Both these bizarre conditions are found in the drop-down list of choices that my medical computer software allows me to select under ‘Reason for visit’. Yet, wayward hair and Disney characters are by no means the oddest of the bunch: patients clearly attend their GP or emergency department for some pretty strange stuff, often enough that computer coders add it to the list. I’m in a doctors-only Facebook group called ‘GPs Down Under’, where Dr Nigel Grebert recently challenged GPs to name the weirdest options available in their software list. The doctors’ quirky favourites came flying. Abnormal Look, Drop Kick, and Skin Turning Black all feature in Australia’s most popular GP computer packages. They probably shouldn’t. Dr Grebert’s own example was ‘Bite, turtle’, although I’d always assumed this was a poorly punctuated Asian toothache remedy. As an aside, for two years I was the Kakadu National Park doctor, where I diagnosed ‘Bite, croc’ twice. And misdiagnosed it once, when a Chinese tourist phoned on a buzzing line to say her husband was coming in with a ‘croc bite’. I prepared the resuscitation gear, but he walked in with just mild grazes. Turns out she’d said ‘Quad bike’ – he’d fallen off one. Back to my colleagues’ favourites. I kind of like Wandering Spleen – perhaps it’s hiding behind the kidney: back after lunch? I can never feel the buggers anyway (I used to just pretend, as a medical student), so I’ll now use this to make my incompetence appear scientific. Suffering from Cud-chewing or Hibernation Syndrome? A few entries must have been invented by rural practitioners after sharing one too many ciders with their farming mates. Cud Chewing, Familial Hibernation Syndrome and the aforementioned Donald Duck Speech are surely only useful if your patient is a cow, a bear or Mel Blanc. I can understand why an animal might feature in, say, Cow’s Milk Protein Allergy (at last, one I have actually used!) but since when did the computer guys decide to enter the whole zoo, just in case? Intolerance to Hamster Protein seems a tad specific. More useful for vets, whose patients are actually hamsters – the unlucky creatures: imagine the constant itch! Other extraordinarily specific diagnoses include Motor Vehicle Accident Involving Spacecraft, and Roller Skating Injury on Farm. Handy for when a skating cow trips over a hamster. Bizarre as these sound, I swear I’m not making this stuff up, although I can’t say the same of motor vehicle drivers who mumble something about a UFO to the investigating officer. My all-time favourite is found in the UK medical software that actually allows Sucked into Military Jet. True! The Australian government equivalent would insert ‘Buying’ as the middle word. Some ambiguous diagnoses take on a life of their own when paired with a mundane one. Cannot Shut Mouth, for example, with Pain in Neck. In fact, the software algorithm should actively prohibit Locked Knees when you’ve already selected Fear of Pregnancy. Of all these weird conditions, the only one I am determined to use some day is Untrue Stories, although I reiterate that this isn’t one of them. A modified version of this article first appeared in Medical Observer, May 2015. This entry was posted in medical writing and tagged diagnosis, Flippant, GP, humour, Medical Observer, weird. Bookmark the permalink.